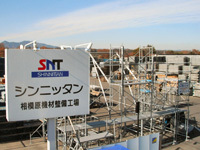 In 1962, SNT started manufacturing and selling frame scaffolding and supporting materials for use at construction sites. Since then, we have been developing our original scaffolding products for over half a century and supplying them to construction sites nationwide. SNT scaffolding parts business division continues to develop products that contribute to safety at construction sites utilizing the technologies and trust we have accumulated. 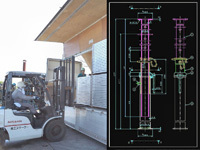 Our motto is:"Adapting to the changing needs of the industry." 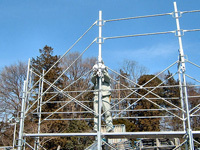 * We are first-class regular members of the Scaffolding and Construction Equipment Association of Japan. We manufacture and sell a wide range of temporary construction equipment including frame scaffolding in both inch and metric sizes. We continue to develop new products with safer and more energy-saving characteristics, and with a focus on industry trends. We are actively operating a leasing business for rational use of construction assets. When leasing SNT’s temporary construction equipment, besides leasing the most suitable equipment for their application, customers also receive technical support for safe operation. All leasing equipment is carefully maintained at our maintenance facilities which are certified by the Scaffolding and Construction Equipment Association of Japan. Construction site safety gets first priority at SNT. This support post is made of high-tensile steel pipe that has about 5 to 10 times the strength of ordinary light-weight supports. This strength enables customers to avoid excessive or unnecessary use of scaffolding equipment at construction sites, and enables more effective use of construction space. This brace has an integrated under-bar. 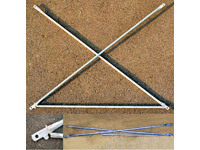 When it is opened in an X shape, the angle closes on the brace pin of the scaffold frame for easier assembly. Along with traditional braces, we provide product types that correspond to span widths. This advanced secure handrail features strength that can endure a drop test of 100 kg. 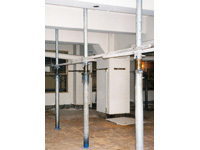 These safety rails prevent falling accidents during assembly or disassembly of frame scaffolding. This safety rail is light, compact, and easy to use. The advanced secure handrail structure allows fewer rails to be used.